» A deliberate crisis – What can we learn from Waitrose? A deliberate crisis – What can we learn from Waitrose? I love food. It is possibly the one thing I talk about most days. I try to produce the best lunches possible to eat at my desk. I think about what I am going to have for supper soon after I finish the first of my morning coffees. And, I consider my lunchtime options soon after finishing the final meal of the day. As a result of this, I have acquired a reputation in the office for being something of a food snob. 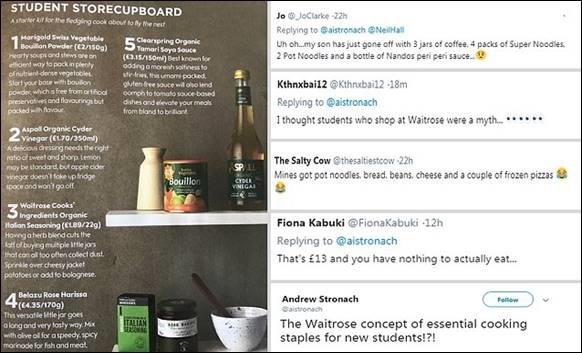 The supposed supermarket of food snobs, Waitrose, recently found itself in hot water following an advert that showcased its ‘student essentials’. It included organic tamari soy sauce, rose harissa paste, organic cider vinegar, Swiss vegetable bouillon powder and Italian seasoning (organic, naturally). So far, so very… well, nothing like a student. However, without entering into a conspiracy, I would suggest that Waitrose knows exactly what it is doing. Or, rather, its PR team does. Every aspect of this seems to have been perfectly scripted for the social media age. 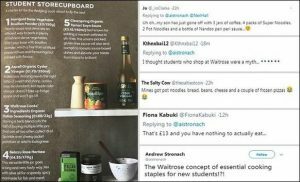 No one will likely be offended, but they may be outraged to tweet with incredulous exacerbation how very unstudent-like Waitrose’s offer is. That’s the point. One page on a magazine has now reached a far greater audience and, crucially, it has only emphasized that Waitrose is high-end, aspirational and stocks more niche products. One might even say the timing is a little too perfect, following the rebrand of both Waitrose and John Lewis. Regardless of Waitrose’s intention with its student store cupboard essentials, this has been a perfectly executed faux-crisis. People are talking about the brand, we’ve all had a good laugh, and the names that paid for the exposure…well, they’re probably delighted. As for the ‘essentials’? Whilst my fellow Redwood culinary aficionado, Josh Owens, approved of the list, he did suggest people could make their own ‘Italian seasoning’. This is the kind of office discussion my inner food snob relishes…and the kind that Waitrose wanted us to have all along.